After spending nearly two hours with customs officials at the Kenyatta International Airport, Dr. Frazier finally made it to Nairobi after close to a full day of travel. I had already been in Kenya for 4 days, having spent my time at the CURE International pediatric orthopaedic hospital in Kijabe, about 90 minutes outside of Nairobi toward the Rift Valley. Arriving late Tuesday night, there would be no time for Dr. Frazier to sleep away the jet lag, as we planned to meet the following morning at 7:00 a.m. to begin a full day of scheduled meetings and activities. We stayed at the Tribe Hotel, near the new United States Embassy, and after breakfast headed into downtown Nairobi for our first visit to the Spine Injury Hospital (SIH). Throughout the trip, we continued to be amazed that a drive like this, only a few kilometers in distance, could take up to two hours. The lack of sufficient roads, traffic signals, police enforcement of traffic laws, and the overall state of chaos among commuters made for a disproportionate amount of our time being spent in the back seat of a taxi, which we agreed was the most frustrating aspect of our visit to Nairobi. When we finally made it to the Spine Injury Hospital we met with the medical superintendent, and orthopaedic surgeon, Dr. Soren Otieno. We talked about the vision for the Spine Injury Hospital, which through it’s private-public partnership, is to become the primary hospital for orthopaedic spine surgery in Nairobi. Many charity organizations, as well as industry leaders, have taken a particular interest in helping to develop the Spine Injury Hospital as a sustainable entity. NuVasive®, a maker of spine surgery devices and implants, is one of the many organizations interested in getting the Spine Injury Hospital off the ground, and through the volunteer charity work of surgeons like Dr. Frazier, training can be provided to local surgeons like Dr. Otieno as the hospital moves forward. In anticipation of our visit, Dr. Otieno had asked three patients, who he felt were in need of spine surgery, to arrive Wednesday morning at SIH. All of the patients showed up with imaging studies in hand. Two of the three patients had advanced spinal disorders that would require fairly urgent surgical intervention, so we booked them for surgeries which would take place on Thursday and Friday. After seeing her in the office on the previous day, our 43 year-old female patient with almost complete destruction of her 5th lumbar vertebrae and accompanying weakness in her left leg was in the operating room ready for surgery. Her problem appeared to be from a bacterial infection, or possibly even tuberculosis. Prior to surgery, we carefully surveyed the donated instrumentation and implants from NuVasive®. We were confident we had the instruments necessary to complete the surgery, but knew that our normal array of equipment was not available and we would have to be creative at times. Being able to adapt to less than ideal circumstances in the operating room proved to be a valuable skill. The surgery was begun knowing that while the circumstances and available equipment were not ideal, this was likely the only opportunity this patient would have to receive surgery, and without it her prognosis was very grim. So the amount of risk assumed was greater than normal, but acceptable given the situation. We performed a partial corpectomy (removal of vertebral body) of L5, placed a cage with bone graft, and placed pedicle screws into the L4 and S1 vertebral levels. We did this all without the assistance of intraoperative x-rays. The only x-ray capability we had was being able to take one lateral x-ray after the surgery was finished, whereas under normal circumstances in New York we would have taken multiple x-rays during and throughout the procedure confirming our positioning and hardware placement. Also, we did not have intraoperative neuro-monitoring, which would have been routinely employed for this type of case in New York to mitigate the risk of nerve injury. Additionally, there was no high speed power burr available to help in performing our laminectomies (removal of a portion of the vertebra), so instead we improvised by using osteotomes and Kerrison Rongeurs to painstakingly nibble away bone until we were satisfied. To make the case even more challenging, we did not have access to the typical hemostatic agents (things to control bleeding) we are accustomed to, such as Floseal, GelFoam, and bipolar electrocautery. Left with only surgicell, we spent a significant amount of time packing our surgical wounds and waiting for the bleeding to become controlled. The procedure took much longer than it would have with the normal full arsenal of equipment we would have had back home, and after about 6 hours we were told by the anesthesia team that the patient was becoming slightly unstable. Fortunately, the case was nearing the end, but this also highlighted the fact that the anesthesiologist too was working with a limited toolbox of equipment. Seeing this, I realized that with the usual monitoring capabilities and equipment by the anesthesia team, this would have likely been an avoidable decompensation by the patient during surgery. Instead, it became an acutely problematic scenario while trying to finish surgery, but fortunately everything turned out ok. When the patient woke up we found her to be completely neurologically intact on examination; we felt a great sense of relief and accomplishment, especially in realizing that without our intervention this patient likely would have had no other alternatives to receiving the care that she required. Although it added to the stress level, performing this case required flexibility, improvisation, and creativity, which can be some of the most enjoyable and rewarding aspects of surgery. Postoperatively, after transferring the patient from the operating table onto a stretcher, I was anticipating wheeling her to the recovery room. I quickly realized there was no recovery room, and to get her to her hospital room, which had 3 other patients in it, we would have to wheel her stretcher outside where it was starting to rain, along a cement sidewalk with steps and sizeable cracks throughout its course. This seemed less than ideal, but I quickly accepted it as routine when several nurses assisting in the transfer moved her in a coordinated fashion. On our drive back to the hotel after surgery it was raining, and along the way we noticed a bus flipped almost completely over in a ditch. With about 20 people gathered around the bus, apparently those who had crawled out, it was unclear how many people were injured and if others were still in the bus. This would have been a newsworthy story in New York, but in Nairobi there was not even a police response. Talking to locals about what we had seen we were told that in situations such as this, because the traffic is so bad, and resources are so minimal, that even if the police or ambulances were called they would likely arrive over two hours after the accident. After seeing this accident, I double-checked my seatbelt and went back to the hotel to prepare for another big day in the operating room on Friday. We arrived at SIH after another painfully long cab ride. Prior to the case we saw a 12-year-old girl in the office with severe scoliosis. For me, this was the most advanced case of scoliosis that I had ever seen. Her CT scan, which included 3D reconstructions, was quite impressive. She had walked to SIH with her grandmother all the way from the Kibera slum, which was a few miles away. This girl has been followed by Dr. Otieno for a few years now, but he has had to consistently turn her away as he has not had the resources or experience to offer her surgery, nor has there been a place where he can refer her to. It was difficult to see her sent home once again without any plan to operate, and it gave me an appreciation for the difficult decisions that doctors in Kenya have to make for their patients. 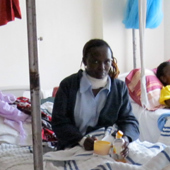 In the U.S., if a patient needs surgery, they almost always can find a way to gain access to this type of care, but in Kenya, where the resources are scarce, the doctor not only has to figure out if the patient needs the surgery from a medical standpoint, but also has to consider the feasibility of the surgery from an economic standpoint. And the reality is that some patients who desperately need surgery are simply told that since they cannot afford to pay for the surgery, they cannot have it. Dr. Otieno then gave them some of his personal money for them to get a taxi back to Kibera. I thought it was pretty cool that the doctor would give a patient his own money for a cab ride, and it highlights the mentality doctors in Kenya have in terms of taking care of their patients. We then once again turned our attention to the patient being prepared to go to the operating room. On this day we dealt with the same set of challenges we had on the previous day, however, on this day they brought a machine capable of taking x-rays during surgery. We were able to take lateral x-rays of the lumbar spine, which we utilized about 4 times throughout the case. Each time an x-ray was taken we had to wait about 30-40 minutes for someone to walk across the street, print it, and bring it back to the O.R. We started with the exposure of L4 and L5. We were operating because of L4 on L5 grade 2 spondylolisthesis (slippage of a vertebral body) with MRI showing disc herniation at this level. She also had ongoing associated radicular pain, no obvious weakness, but significant neurogenic claudication secondary to stenosis with symptoms present after walking only short distances. She was 62-years-old, with a history of diabetes. Interestingly, she had multiple small vertical scars in her lumbar spine region. I asked her what these were from, and they were from bloodletting procedures that had been done multiple times over the years. It is felt by “healers” in Kenya that creating small cuts in skin of the lower back can release the pain by allowing blood to drain out. Intraoperatively, we found ourselves having to once again employ creativity and patience as we dealt with the same issues of lack of equipment and agents to control bleeding. A technology that was not available to us the previous day, we were able to take an x-ray to confirm that our approach was at the L4 and L5 levels. While we did have x-ray available, it was not the instantaneous digital x-ray we are used to, and each x-ray taken meant a 30-40 minute wait. It took 3 or 4 adjustments, each time having to wait for the x-ray, before we were satisfied with our hardware placement. All in all the case went fairly smoothly and most importantly the patient woke up with full neurologic function. After the surgery, we drove immediately over to the office of the Ministry of Health in downtown Nairobi. We met with one of the top aides in the office of the Ministry of Health, a woman who is responsible for the coordination and oversight of hospital partnerships involving both public and private sector funding. For 30 minutes Dr. Frazier and Dr. Otieno described their vision for the Spine Injury Hospital and emphasized the importance of government funding as the SIH is developing. Part of the plan in establishing the SIH is that NuVasive® will offer donated instrumentation for charity cases and coordinate regular visits of U.S. spine surgeons to offer training to spine surgeons in Nairobi. Part of our discussion included ways to make the SIH a sustainable entity for years to come. She seemed supportive of SIH, and said that Kenya’s health budget is completely used up until the next fiscal cycle, July 2011. In the meantime, she wanted Dr. Otieno and SIH to specifically delineate specific equipment and infrastructure needs of SIH. After our meeting at the ministry of health we headed back to SIH and saw about 6 or 7 patients in Dr. Otieno’s office. Of these, 3 were indicated for surgery, but since we were leaving and the resources were not there to perform surgery, it appeared as though they may have to wait until another U.S. spine surgeon is back in Nairobi if they are to undergo surgery. I was struck by the doctor/patient interaction. Dr. Otieno did most of the talking while the patients listened in a completely agreeable way. Many of these patients had waited over 6 hours to see us, but did not complain and were thankful for our time when we finally did see them. It bothered me to think that we could not do more to help more patients, but the reality of going to a developing country for one week is that you can only help a few people, and you will come across countless more that you cannot help and who may never get the help they need.